Your Source for High End A/V Equipment and Home Automation! Not sure exactly what you are after in your new or existing home? Sit down with us at Audio Addicts to go over what type of options are available. Audio Addicts can design and implement any type of system ranging from entry level to full out control of all aspects in your home with one remote. Audio Addicts can help you create a system that fits both your budget and lifestyle. Audio Addicts have experience in a wide range of products, including the most popular audio and video products in the world. Do you want to hide your TV when not in use? Audio Addicts can place TVs on motorized lifts to have them come out of furniture when turned on but out of site when not in use. 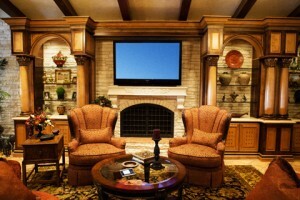 TVs can be placed in a wall behind a piece of art or cabinetry only to be revealed while in operation. Have you always wanted a projector but don’t want a large screen permanently attached to your wall? Audio Addicts can design a system where the screen and/or projector can come out of the ceiling only when you want to watch the big game or movie. Maybe you want a cinematic experience with theater seating, great surround (Dolby Atmos 9.2.2 Surround) and 150” Projection System in your home, well Audio Addicts can design the ultimate in home cinema room, we call it Cinema Grade Home Theater. Whether you have your own ideas or just a problem, we can help you come up with a solution that works for your individual needs. From hidden speaker systems, distributed audio systems, home theatre systems or integrated automation systems, we will create a system specifically for you. © 2015 Audio Addicts. All Rights Reserved.